UConn is the most prominent team in women's college basketball, but the Huskies aren't a No. 1 seed in the NCAA Tournament for the first time since 2006, so it's Baylor who's favored to win. 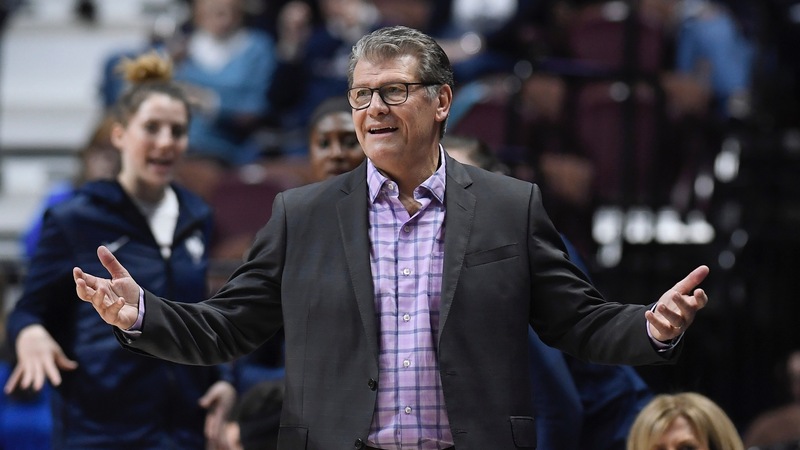 UConn is the most prominent team in women's college basketball, but the Huskies aren't a No. 1 seed in the NCAA Tournament for the first time since 2006, so it's Baylor who's favored to win. UConn's relegation to a No. 2 seed was a bit surprising (even though [we knew about it before we were supposed to](https://www.newsday.com/sports/media/coaches-frustrated-after-espn-botches-ncaa-bracket-rollout-1.28673983)), considering the Huskies (31-2) are ranked second in the nation in the Associated Press poll, and lost only to Baylor (the No. 1 overall seed) and Louisville (also a No. 1) this season. They also beat defending champion Notre Dame (another No. 1) by 18 in December. [Here](https://www.ncaa.com/news/basketball-women/2019-03-19/2019-ncaa-womens-basketball-bracket-printable-tournament-pdf) is the complete bracket, with Connecticut at the bottom of the Louisville bracket. The Huskies haven't won the title since 2016, the last of four straight, but also haven't missed the Final Four since 2007. They were without two-time American Conference Player of the Year Katie Lou Samuelson for the conference tournament with a back injury, but the senior is expected back for Friday's first-round game against Towson. Baylor (31-1) only lost at Stanford back in September. The Bears have a good mix of size and speed, with 6-7 center Kalani Brown, a senior who leads the team with 15.7 points per game, forward Lauren Cox and guard Chloe Jackson. They also have a coach in Kim Mulkey who's won two national titles at Baylor (2005 and '12) and another as a player at Louisiana Tech in 1982. Coverage of the women's tournament begins 11 a.m. CT Friday, when Louisville plays host to Robert Morris, and continues the next four days on ESPN2. __MORE:__ [Our complete NCAA Tournament men's coverage](https://www.betchicago.com/ncaa-basketball-betting) ## Women's NCAA Tournament odds *Odds from the Westgate SuperBook as of Tuesday night Baylor: +180 Notre Dame: +225 UConn: +250 Mississippi State: 12/1 Oregon: 16/1 Louisville: 20/1 Stanford: 40/1 Iowa, Maryland, FIELD: 100/1 __PLAY:__ Our [free daily contests](https://betchicago.chalkline.com) for the chance to win a BetChicago prize pack.